Our Mountain View Apartments overlook the valley to the ranges beyond with glimpses of Lake Baroon at the bottom of the valley. The apartments are designed so that the kitchen, lounge and outdoor areas take advantage of the views. The apartments are fully self-contained. The open plan living area features a full sized kitchen with stove/oven/grill, microwave and full sized refrigerator. The spacious lounge area includes a log fire. 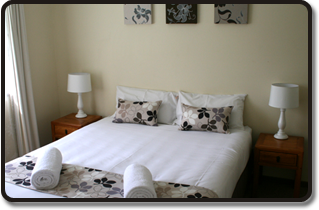 The main bedroom features a queen bed with the second bedroom having two single beds. The double fold out sofa bed provides additional bedding if required. A separate bathroom and a separate toilet complete the apartment. Seating is located just outside your apartment to allow you to enjoy the view. Off street, under cover car parking is provided. Mountain View Apartments can Sleep up to 5 with Sofa Bed in lounge. 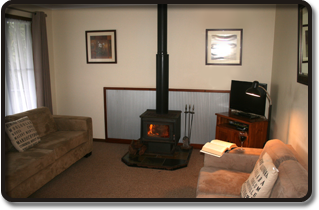 Home ~ Apartments ~ Facilities ~ Rates ~ Attractions ~ Map ~ Contact Copyright © 2013 Montville Holiday Apartments All rights reserved.